February 21, 2011 - Boeing on Wednesday made a surprise donation of $26,000 to Washington State Leadership & Assistance for Science Education Reform (LASER). Boeing's donation comes from proceeds from its sponsorship of the IMAX film "Legends of Flight." The presentation took place during the monthly executive board meeting at the Pacific Science Center in Seattle, Wash.
"Boeing is delighted to be able to support this great organization in its effort to give teachers and principals the training and resources they need to improve science instruction statewide and beyond," said Boeing's Tim Copes, vice president of Manufacturing. "We expect this to be the first of many donations to educate, engage and motivate children in science as the film continues to open at theaters around the world." Additional financial donations will be made to support science-related initiatives as "Legends of Flight" continues to play at theaters around the world. Boeing receives 10 cents for each ticket sold. The film highlights legendary 20th century airplanes, as well as the manufacturing, testing, rollout and first flight of the 787 Dreamliner, the first all-new airplane of the 21st century. "The film is a tribute to all of the people who made the 787 possible," said Scott Fancher, vice president and general manager of the 787 program. "And through the great work of Washington LASER, the film is now assisting schools with research-based science programs. We see this donation as an investment in creating a future workforce that is inspired to launch the next generation of discoveries, innovations and inventions." "Legends of Flight" opened on June 8, 2010, and is currently running in more than 30 theaters around the world. Washington State LASER is a partnership program that started in 1999 with the National Science Resources Center (NSRC), the Washington State Office of the Superintendent of Public Instruction, Pacific Northwest National Laboratories, Pacific Science Center and Educational Service Districts and lead school districts from across Washington state. The new, super-efficient Boeing 787 Dreamliner, is the culmination of years of international corporate cross-pollination, drawing on the expertise of Boeing?s domestic and international production capabilities as well as the individualized expertise of many noteworthy global suppliers. This impressive amalgamation has resulted in a leading-edge airplane that brings flight ranges of up to 8,500 nautical miles to mid-size airplanes featuring significant passenger loads. Legends of Flight, a 3D documentary film, brings audiences into the 787 cockpit, providing an appreciation for the collaboration that has delivered this technically advanced flying marvel. The film treats audiences to a point-of-view compilation of the actions and reactions of the Dreamliner?s chief test pilot, Mike Carriker, as he helps make aviation history with this airplane that features key contributions from 10 countries and 15 different US states. 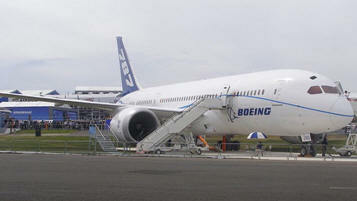 Carriker, who has flown almost every current Boeing aircraft, believes the film more than does justice to the 787. ?Stephen Low, who directed this movie, has used all of his prior experiences to capture the combination of emotions and excitement that accompany any first flight,? said Carriker. The team involved in the development and testing phases for the 787 has been able to give the film production company unbelievable access to the inner workings of what it takes to launch a new airplane. ?Nothing compares to the elation that a pilot feels after the successful take-off with a totally new airplane,? said Carriker. ?Until I saw some of the early film footage, I had no idea that this could be captured and translated to a viewing audience. Low has gone the extra mile in production quality and it will pay-off with IMAX theater audiences,? he concluded.